On January 23-25, 2004, Vienna's Donauzentrum was home to one of the most traditional events in Flight Simulation: The Interstate 2004 European Championship in Flight Simulation. Interstate Events have been around since the dawn of time of flightsimulation. The idea is to have a group of teams fly together in a 24 hour long event, using networked PC's. The brainchild of Mathijs Kok, the technology became a reality when Simon Hradecky and Enrico Schiratti came up with the software to do it with, Simon providing the network side and Enrico procucing the mapping software FS4MAP, later known as "Schiratti Commander" and today as "Wazzup" and something called "Satan" which has now been upgraded to "Beelzebub", a software that allows to inflict all sort of evil to the teams. My first exposure was Interstate 7 where I headed a team of Compuserve FS Forum members to the last place in the aviodome of Amsterdam. 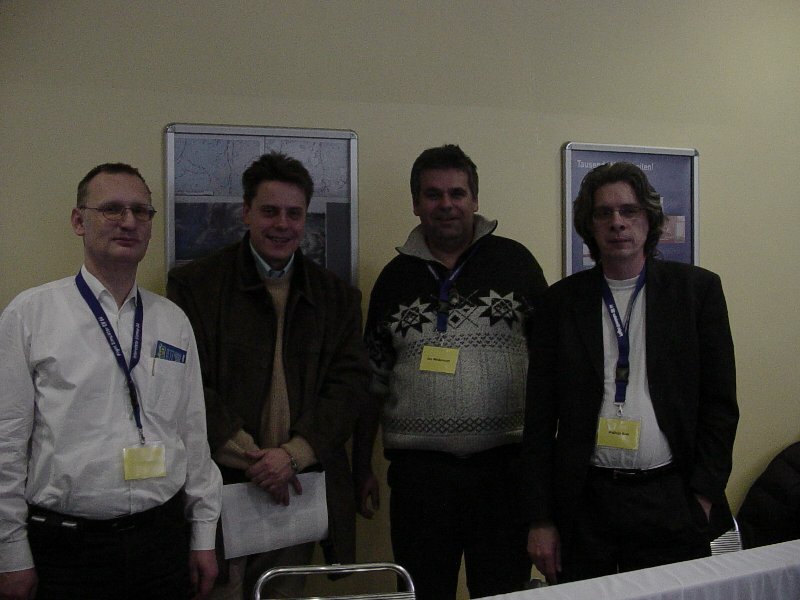 Little did I know that some of the team members I had then were to become cornerstones of the flight simulation world later on: Stefan Schäfer presented his first Hong Kong Scenery and Peter Dowson were amongst them. We flew from Amsterdam to Tokyo by the way of Kos, Tel Aviv, Bahrein, Karachi, Calcutta, Hong Kong Kai Tak and finally Tokyo Hadena. Interstate 8 was held a few years later in Krefeld, Germany. We were flying around Europe. But I don't need to tell you much about it, there is a much better report to be found here. 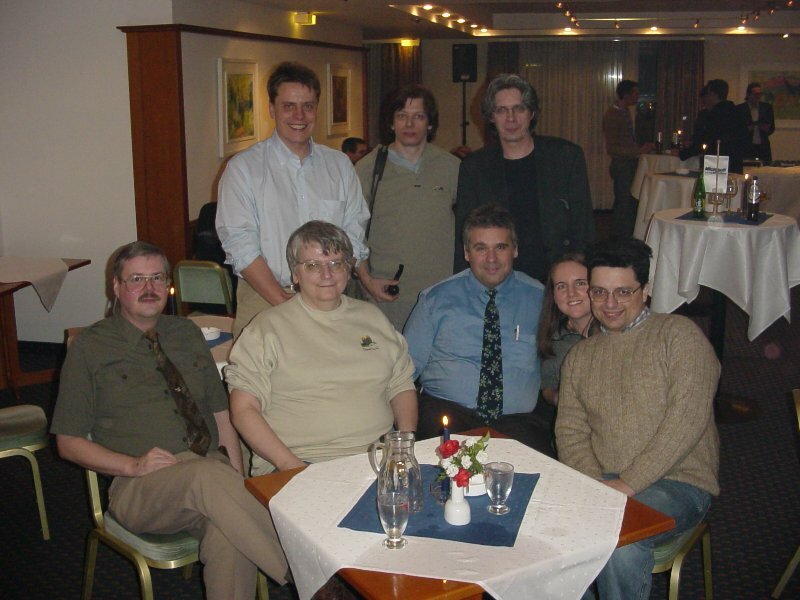 The Vienna Interstate 2004 brought together a lot of people who had neither seen each other nor worked together for more than a few years. Stefan Schäfer organized an event which was an exiting and also moving thing for me and my colleagues, an event which ended with total satisfaction for all concerned. Meeting old Friends: On the evening before the Interstate we met in the Austrohotel at the Donauzentrum for a small reception. Front Row: Richard Cook, Simon Hradecky, Urs Wildermuth, Angela and Umberto Collapicioni. The next day, the competition started. First, a test of flying skills was asked for by trying to fly the Wright Flyer to any respectable lenght. Then, the contestants flew around a Kitchen Scenery, designed by Oliver Moser, and were looking for things like scrambled eggs and paper clips. Thereafter, after the laughter had died down, we added another task in precision flying by making the teams land at Meigs field: On a 747! Then it was down to some serious line flying. The teams took off from Glasgow and headed to Keflavik on the first leg of an atlantic crossing. Or so they thought. They did end up in fact at Vagar (EKVG) on the Faroer Islands. Simon and me providing ATC to them, they had a good sweat broken up by the time they reached the runway. The next task was to fly from Vagar to Keflavik, we had a merry time getting all the teams of the ground, as some of them spent quite a time to figure out wether to go or not to go. Finally they all landed at Keflavik. The next leg to Boston had to be cancelled as per that time, a loud music band playing just behind the teams made communication impossible. Stefan decided to reposition to Gander (CYQX) and fly to Boston from there. 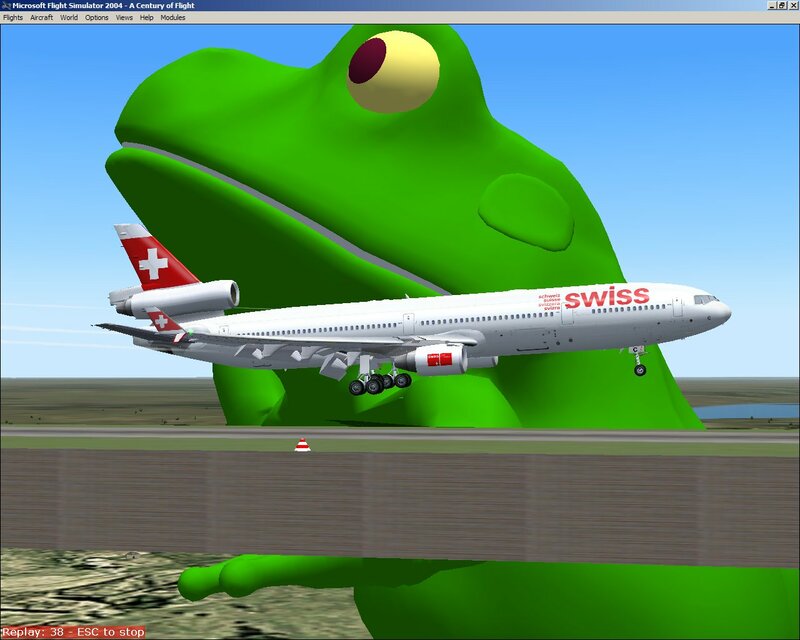 This was done under the watchfull eyes of 2 members of the Wien FIR of VATSIM who reliefed us for the night. Simon and me came back into action when the teams approached 40W on the return leg to Lisbon. Some of them had already had the idea what was to follow as they had spotted the "Air Transat" logos on their A330's . And so it came. One by one had all it's enignes taken out by Beelzebub in the form of Mathijs Kok this time and landed perfectly at Lajes Airbase on the Azores. After that, a well deserved break for Breakfast was in order. To end the competition, Andras Kozma had thought up a scenery that got everyone's attention in a hurry! A Cessna 172 was placed on the end of what must be the biggest GA airport in the world with 8 parallel runways. From there, they had to fly through loops, land on aircraft carriers, on a Frog holding a runway and through a labyrinth. Great fun. 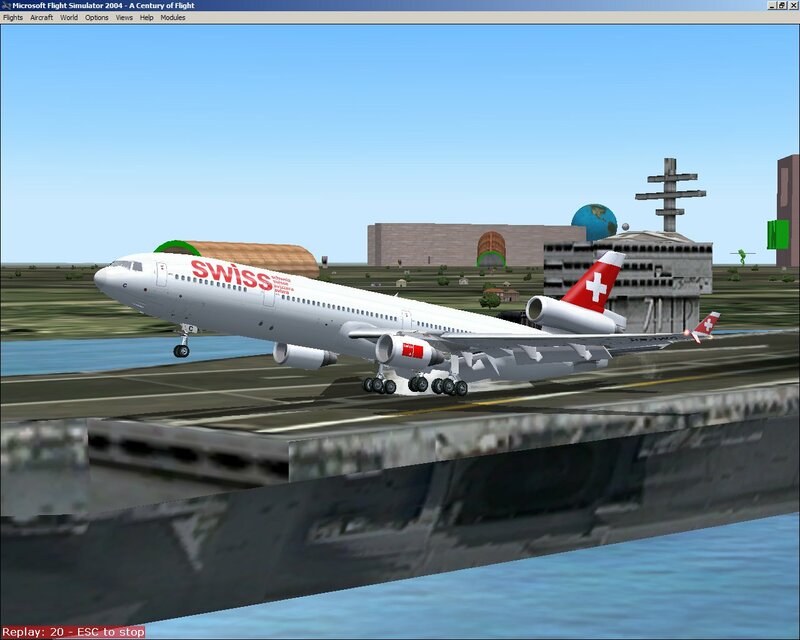 Here's a screenshot of my trials of that scenery, with the slight misunderstanding that I was to use a Cessna for it. Well, not knowing that, I used something else! Anyhow, the guys did it much better than I did, so they had a great time and crashed only a couple of planes. The price judges, Richard Cook (a real life simulator instructor on the 777 and 747 at British Airways) and Matijs Kok discussed the outcome with us and we all had to agree to a winner. That was the hardest part of the Interstate! In the end, the Interstate was won by : Everyone who had been there in effect. Yes, there was a winning team, who performed superbly, but so did the others and all of them shared the dream of flying real planes for a night! In the end, we left Vienna with the satisfaction of a great event with nice people around and a super spirit. Thank you Stefan Schäfer for bringing the Spirit back to Flight Simulation for these 3 days!